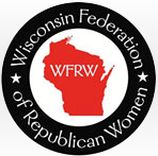 The Wisconsin Federation of Republican Women is one of the largest and most influential women's political organizations in the state. We have been a state affiliate of the National Federation of Republican Women since 1940 and are part of the NFRW's approximate 95,000 nationwide membership. Our clubs across the state hold local prominence and have the clout to attract political speakers to engage us and harness our grassroots energies! Elected Officials and candidates are eager for our input, our voices, our votes, and our influence. As a member, you become part of the WFRW team with a current membership at approximately 1,000 and 20 local clubs. Please join us today, you'll be glad you did! With approximate 95,000 nationwide members, the NFRW is one of the largest women’s political organizations in the country. Copyright 2013-2016 Republican Women of Dane County. All rights reserved.